[SINGAPORE] The government is monitoring economic developments and will introduce measures to support businesses and the economy if needed, said top officials from the Trade and Industry Ministry yesterday. Europe's sovereign debt crisis remains worrying while growth momentum has also slowed in the United States and China, said Second Minister for Trade and Industry S Iswaran in Parliament yesterday. The slowdown in these economies has affected Singapore's exports to some extent, he said. 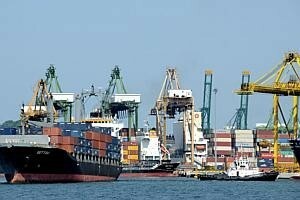 Total non-oil domestic exports (NODX) growth slowed from 6.1 per cent for the first quarter of the year to 2.5 per cent for the first two months of the second quarter. In particular, NODX to the US and European Union for April and May contracted compared with a year ago, while the NODX to China grew at a slower pace. "However, there is no immediate need for government to step in with measures to cushion the economy from the slowdown in external demand," Mr Iswaran said, pointing to Singapore's tight labour market, healthy job creation and a low unemployment rate. Singapore's NODX to regional trading partners such as Indonesia and South Korea also continues to expand briskly, he added. Singapore's economy is expected to grow by 1-3 per cent this year. Still, the situation in Europe and the global economy remains challenging and fluid, Mr Iswaran said. "The government will continue to keep a close watch on developments and stands ready to respond when appropriate." In a separate statement, Minister for Trade and Industry Lim Hng Kiang said: "We are ready to respond with measures to help Singapore businesses if needed. The exact form of the measures will depend on how developments in the global economy unfold and the specific needs of businesses affected." There were several measures in this year's Budget to help businesses, he said in a written reply. These measures help businesses build capabilities, enhance productivity and expand their market reach in this period of low growth, he said. There are also financing schemes to help businesses grow should private financial institutions become less ready in extending credit due to portfolio covenants, he added. In the banking sector, the direct impact of the eurozone crisis on banks in Singapore is unlikely to be significant, said Deputy Prime Minister Tharman Shanmugaratnam, who is also chairman of the Monetary Authority of Singapore. Mr Tharman said in a written parliamentary reply that loans and investments made by banks here in the eurozone comprise around 5 per cent of their total exposures. Banks here also have less than 8 per cent of their funding coming from that region. Credit supply in Singapore has not been significantly affected by eurozone bank deleveraging, he noted. More importantly, other well-capitalised banks with strong liquidity positions, including those from Singapore and other parts of Asia, have stepped in as some eurozone banks pulled back. Asian banks' market share of export bills for Singapore-originated trade activities rose from 48 per cent in Q1 2011 to 59 per cent in Q1 2012, Mr Tharman said. For trust receipts, Asian banks' market share increased from 56 per cent to 63 per cent over the same period.